Before applying for the Wells Fargo Home Projects credit card, we want you to be informed that DELCOR has many financing options. We can offer multiple financing options, such as 12 months special interest with approved credit. During the application process, you will notice that the standard rate for using the Home Projects credit card plan is 28.99% interest. This interest rate does not apply to our program as long as you are using the financing through Delcor. For questions about the program, please call us at 252-321-8868. 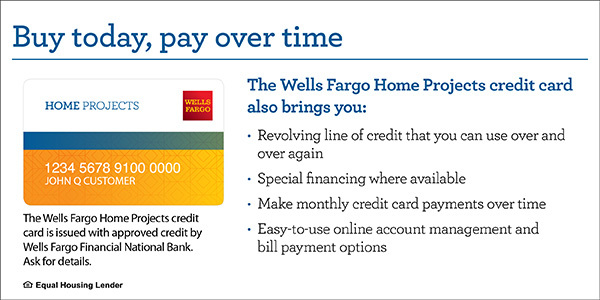 *The Wells Fargo Home Projects credit card is issued with approved credit by Wells Fargo Financial National Bank, an Equal Housing Lender. Apply for the Home Projects credit card by selecting the button below.